The Goddamned are a Swedish band from Falkenberg and were formed in September 2001 with ex-members of Pagan Rites, Moria and the Ancients Rebirth. The band is a four piece (like Black Sabbath) and heavily influenced by this genre of Doom Metal. The 3 tracks on this CD are just part of the session that was laid down in the Hit Parade studio in Feb 2002. The playing is very solid but I did not find the songs all that interesting or unique. After hearing the demo a few times nothing really stuck in my head about the band (sorry guys). The band try to create grooves like Spirit Caravan but don’t quite get you going in the same way. If you are a fan of the Doom-groove thing check these guys out, you might disagree with me! 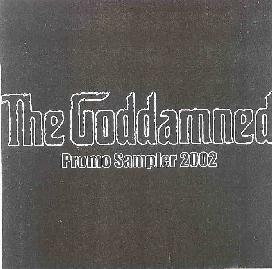 For more information you can visit The Goddamned web site at: http://www.thegodddamned.com.